2 So After Writing When Do I Actually Start To Get Loads Of Traffic? 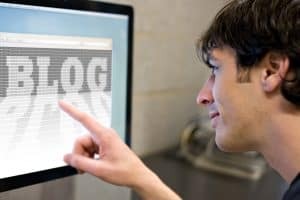 A young main pointing at a computer screen that reads BLOG in the web browser window. As time goes on more and more people want to start some form of online business. They have heard you can work from home and make good money online and for the most part it’s true. Many want to start a blog business and you can make good money from blogging. There are several ways to start this type of business and a bunch of ways to monetize and make money from your blogs. The biggest problem I see when people want to get into blogging is they think way to big right out of the gate. They either want to start 50 websites or start coming up with many ideas to get their bogging business off the ground. What they need to be doing is stay in one lane and start small, get used to the business and then branch out from there. Again the biggest mistake people make when starting out is doing too much too fast. And then, what happens is they get burnt out and they never get where they want to be. In your first year as a blogger there is much to do. You will have to learn a CMS, if you have one like wordpress, a little SEO and let’s not forget writing. Oh yes, writing is the most important part. Without the writing nothing will happen. This is why they say “content is king”. Your content is the most important part of your blogging business. This is the reason everyone will stop by your blog. So you want to learn how to write for blogging. You will need to learn how to write so people find your writing informative and helpful. The biggest thing you want to gain, is readership following your blog. These are the people who trust you and eventually buy from you when you recommend products. So seriously learn how to write. Now, when you get started writing for your first blog, it’s going to take a serious time commitment writing and posting articles. This is why it’s important to pick a blog topic you love and will like to write about. As, you will be writing a good amount. So After Writing When Do I Actually Start To Get Loads Of Traffic? This is a hugely common question and the answer is, it depends. I have seen people write a few shorts posts and get loads of traffic and I have also seen people work for a year and a half writing everyday and only after all that they just begin to get traffic. And this is all related to a few things having to do with how much authority you already have in Google, backlinks etc., they keywords and topics you pick and how competitive they are. When your first starting out, you will want to write about keywords you can with a Search page for. These will be keywords with low competition and a decent amount of searches every month. But again, as I said you also want to gain readership and not always worry about Google. There is also the tactic of just writing daily and in about a year you will start to get traffic. This is not a bad avenue to take, you just should not expect it will be a fast road to tons of blog traffic. Think about it like you have to prove yourself first before you are rewarded. And this will take a good amount of content. I also wouldn’t think about it like you have to have as many pages as possible. Again its important to have really good content. Take for instance the Wire Cutter. They write reviews for many products and then they have Amazon affiliate links in their posts. When someone clicks on these links and buys from Amazon they get a commission. But the writers at the wire cutter will sometimes spend weeks getting their posts ready for publication. And their minimum post length can be 5000 words. The reasons why the wire cutter gets a huge amount of traffic is because they have loads of really useful and great content and they have many people linking back to their website. So it takes time to make things happen when making a blogging business. But if your willing to put in the time and write and not look at your traffic stats for a while and just keep focusing on great content things will eventually happen for you. In this video Mike Rogers explains how long it takes him to make things happen on his sites. As I said you should start with one blog when getting started. And WordPress is a great CMS (content management system) to start with. Having one site will will allow you to learn what you need before you move onto the next thing. And I always talk about what I call Foundation Marketing. One website at the start will be less stress and provide the basis you need to get started. And, once you get that website going you can then start other websites or do other types of marketing such as paid advertising. An absolute way to make money online is having more then one blog. This is the way to go after you first get started. Just don’t stress yourself out trying to get there. Starting and focusing on one blog will allow you to have the funds later on to get your other blogs off the ground. But having more then one in your blogging business will allow you to make more money. You could offer advertising on all your blogs. If you have a few blogs that get a decent amount of traffic you can offer your own advertising to make money. And you don’t even need to have a salesperson selling your advertising. You can use websites like Buy and Sell ads or use a WordPress plugin like OIO Publisher.